Accounting of the raised fund will be filed under this thread as well. 1. We managed to raise US$915 from a total of 22 funders. Namaste. 3. The DBC-SG Support Group Exco team would like to dedicate this beautiful Vivaldi performance to the 22 funders, enjoy. 1. We managed to raise US$1,148 (achieving 29% of the base target) from a total of 33 funders. Namaste. I will share more about us when either (a) we reached our base target of $4,000 or, (b) when this campaign ends. Step 7: While in the queue waiting for your turn, load our Youtube 3 mins campaign video http://dhz.us/-/dbcv in your iPad-Tablet / Laptop / Smartphone and where possible, show the MP the short video if possible as that would help set the stage for your discussion. Step 8: If there is any question from the MP that you are unable to answer, just write them down dutifully and inform your MP that we'll revert back to him. Contact me at ipresearch70(at)gmail.com the list of questions and the DBC-SG Support Exco team will prepare a response for the good man/woman accordingly. 2. Be mindful that your MP may be hearing about Speculative Invoicing business practice for the first time in his life, therefore, while there are loads of information on why Speculative Invoicing is wrong, try not to overwhelm the MP - unless he/she is the Law Minister or Ms. Indranee. (b) teach our MP on what is Speculative invoicing but just sufficient for him to understand the basics - otherwise, it would be a wasted trip (preparation, queuing, heart skipping many beats, etc) For the first meeting with our good MP, simplicity is the key. This is a public report on a possible 1st instance of a Sabotage staged by our Opponents. 1. The latest strategy of Meet the MP appears to worry our opponents. At this moment, the most cost-effective strategy is 2(b) and if the public has other interesting strategies that we can consider, do reach out to us. 3. I repeat, for those who are going to meet your MP, you are highly recommended to follow the 8-step approach that I have outlined in the previous update. 1. An All-in-One PGP Webpage has been setup to facilitate the secure exchange of messages among the proponents - this is a good alternative to sending the traditional Private Message in the discussion forum where one needs to register to an account revealing one's email address. Update: People asked those of us actively helping the "DBC-SG Support Group: Why are you helping the alleged infringers? THE recent article "Transforming lives, one student at a time" (AsiaOne; April 23) clearly described the power and beauty of volunteerism. Volunteers donate their time, effort and energy to help some academically weaker students from low-income families. With the assistance and psychological support received, these students flourished - brought back to the proper path to pursue better academic qualifications and are now able to repay what they have received through volunteerism. Volunteerism is a form of donation, which we can inculcate in our society. Students can be taught to volunteer in areas that they are comfortable in or confident with. In this way, they are not only helping others but themselves, too, as they have the opportunity to hone their skills and improve their self-confidence. Adults need not always donate money but can explore ways to donate their time, effort, in their areas of expertise, to help those in need. For instance, those who are academically inclined can give free tuition to students; those have green fingers can help share their knowledge on growing plants; those who are good coordinators can help to organise day trips for students or seniors, and so on. These are some of the ways we can make our society better and more inclusive. Well said, Ms Lim. Singapore needs more people like Ms Lim and less of adult cybertaunters & cyberbullies. 1. All verified Affected Parties would have received a BCC email from me regarding a specific request relevant to your group (do check your junk box in case this bcc email landed up in your junk or spam box). I need a reply by this Friday. 1. Likewise, I have also sent all of your a separate BCC email regarding another request relevant only to your group. 2. Ignore the email (ie. need not reply) if it is not applicable to you. As we progress towards the 50% target mark, I dedicate this awesome Autumn Allegro from Vivaldi's Four Seasons to you. Enjoy. 1. We received the 1st contribution from USA. Thank-you America! 1. Thank-you paoswee for being the first all the way from USA to contribute to our campaign. 2. 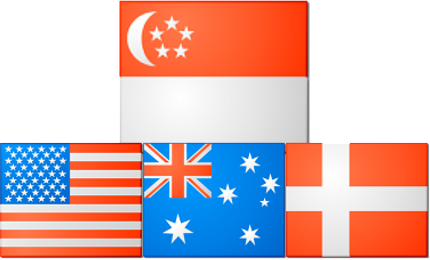 When USA is ready and starts a DBC-US Crowdfunding Campaign, I'll seek to be the first from Singapore to reciprocate. 3. For our Aussie friends, when you are ready with a DBC-AU Crowdfunding Campaign, I am willing to contribute in-kind for the setup of your Indiegogo campaign. Same for Denmark when you are ready with DBC-DK Crowdfunding Campaign. Just drop us a note. Update: Transparency and What Funders Information do I get from Indiegogo? In this update, I would like to further share with the fund contributors & the prospective fund contributors what information will I received when you contribute to this campaign. If anyone knows how to make contributions to Indiegogo via Bitcoins (direct or indirect), please reach out to us.